I've been out of commission for a couple of days this week after receiving some kind of nasty insect bite- I'm not sure what it was since I didn't see the culprit but I'm thinking possibly a spider. The grass needs cutting and the chicken coops need cleaning, but I still don't feel like being outside much right now... so I'll be taking it easy like Lily is in the picture above and visiting my blog friends today. Remember these cute, fuzzy little chickies from just a couple of months ago? "Rollin', rollin', rollin', Keep those feed dogs rollin'...."
Is this not the custest fabric you've ever seen? *squeeeal* It makes me smile every time I look at it. Wordless Wednesday: Cold or Hot? A tree full of pears. A hubby that likes to landscape. If you live off the beaten path and have animals of any kind, predators are simply a part of life. They don't care that your animals have names, or that you raised them from babies... predators have babies of their own to feed and a meal is a meal. 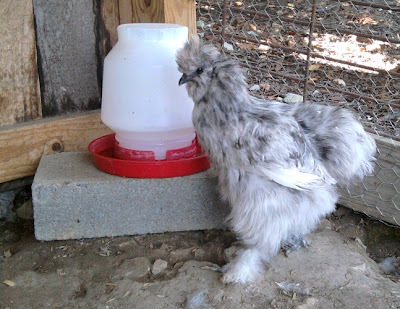 Most days I turn my silkies out for a little 20-30 minute "recess" in the afternoon while I sit nearby underneath a shade tree with a book, keeping a watchful eye out for danger. Friday was different- I had just arrived home from running errands and had a million things to do, so I decided to turn them out for just a few minutes while I unloaded the bags of chicken feed from the back of the car.